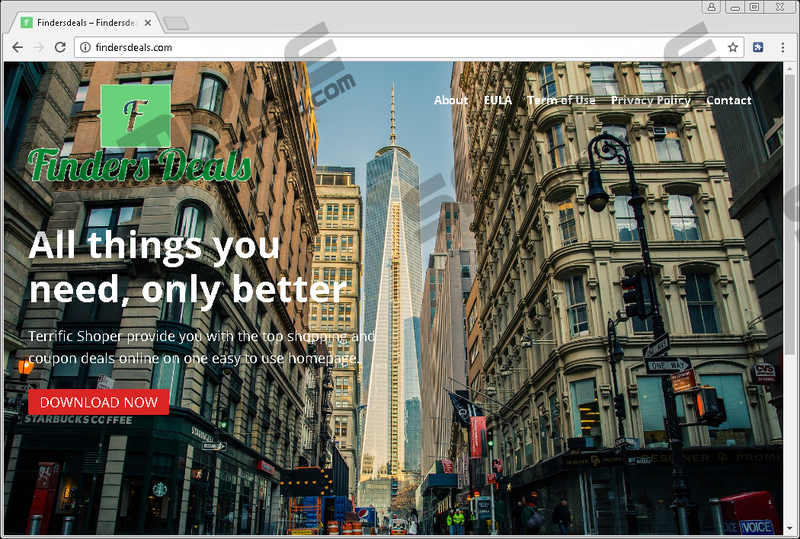 If you have recently installed a browser extension called Finders Deals, then you should know that it will not help you in finding the best deals, but rather show you a lot of annoying ads while you browse the web. We have classified this program as adware and suggest that you remove it because it is useless, intrusive, and potentially dangerous because you cannot know whether the advertisements are legitimate. To find out more about this adware, please read this whole description as it contains the most relevant information that is currently available. This program caught our eye because it does not specify the company that created it. Upon closer inspection it became clear that the developer and publisher names were not disclosed on purpose. Finders Deals’s developers have set up a website that is dedicated to distributing it. On top of that, they have it featured on the Chrome Web Store. Now, the fact that it is featured on that store does not necessarily mean that this program is legitimate. We have also received reports suggesting that the developers have bundled this adware with malicious software installers that can install it on your PC secretly. Nevertheless, the installers might let you deselect Finders Deals by opting for advanced installation settings and unchecking its respective checkbox. However, if this adware manages to get onto your computer, then it will start to show you all kinds of commercial advertisements. It might show its ads in the form of coupons, banners, pop-ups, and so on. The ads generate advertising revenue, but only if you click them, so the developers are incentivized to customize the ads and they can do that after collecting information about you. This adware can collect non-personally identifiable information automatically. This information can include the URL that referred you to its site, IP address, computer’s name, operating system type, and so on. This adware is similar to Torpedo deals and we are positive that both of them come from the same developer. Furthermore, it is reasonable to think that their developer will release more similar programs in the future. Finders Deals is compatible with Chrome only and our research has revealed that this program was configured to also replace Chrome’s new tab page address with http://api-client.mobitech-search.xyz, a shady search engine that was created by Mobitech. However, this search engine does not work. You can access it, sure, but you cannot use if to search the web. In closing, Finders Deals is an undesirable, useless application that shows advertisements that may not necessarily appeal or help you. The ads are there to make money and some of them can be rather intrusive. Moreover, some of them can come from shady sources, so safety is an issue as well. Therefore, we suggest that you remove Finders Deals as soon as the opportunity arises. The removal process is pretty straightforward as all you have to do is remove it from your browser’s list of extensions. Please consult the guide below for more information. Find Finders Deals and click Remove. Quick & tested solution for Finders Deals removal.